I get to do some weird and interesting stuff. My latest commission - re-enacting the assassination of John F Kennedy in Dallas for the Discovery Channel - must register fairly high on the weird and interesting meter. It began with a suggestion made some months back to an acquaintance in Hollywood. 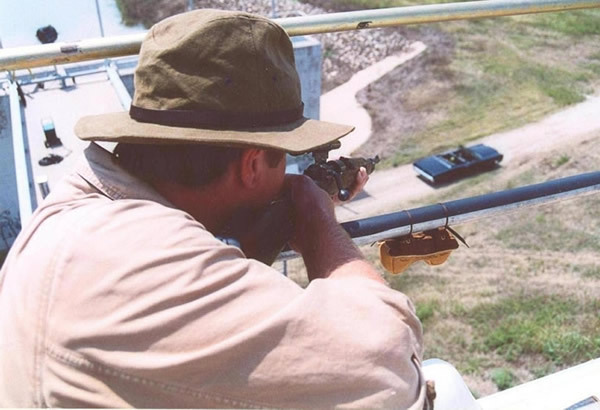 I told him that it would be intriguing to test by practical experiment the official version of the JFK shooting (all the more with the 40th anniversary coming up). The plan would be to get precisely the weapon that Oswald (allegedly) used and deploy it in an exact reconstruction of the original incident. Timed shots would be made at the same angles, distances, and target (a vehicle moving at approx. 10mph). As far as I am aware, no-one had ever carried out such a reconstruction properly. There had been a number of live firing tests (including those by the FBI and US Marine Corps Marksmanship experts, Major Anderson and Segeant Zahm), but all were flawed for one reason or another. In my mind, the key question remained unanswered. Could the president really have been shot with a cheap, military surplus, 6.5mm Carcano as the Warren Commission suggested? Was it all a cover-up? Was Oswald a “lone nut” or was the truth much more sinister? Could there have been some sort CIA/Mafia/Soviet/Cuban inspired plot? Were we really to believe that Oswald, the former Marine, who tried to defect to Russia (and who did live in that country), acted alone? And, what about Jack Ruby - Oswald's assassin - was he just another lone nut? It is fascinating stuff and the food for a hundred conspiracy theories. My contact in Hollywood said he would tell his contacts about my ideas for a programme, and I forgot about it all and got on with gun-testing and teaching people to shoot. One day, out of the blue, a message appeared on my E-mail from a programme researcher: would I be interested in being involved in a production for the 'Unsolved History' series on the Kennedy assassination? I was in the United States setting the targets for the Pennsylvania State Sporting Clays Championships. I dialled the number given and spoke to a girl called Rachael: “We have an idea and believe you may be the person to help us”. She went on to spell out my idea for a reconstruction. Who was I to quibble? It soon became clear that I was being offered the chance to do exactly what I had originally suggested - test the official version. Conventional weapons would be used, and, so it transpired, would a laser as had been used when I had 'shot down' the Red Baron in France. The fee I proposed was not rejected out of hand. And, as encouraging, the experiment would be properly funded and would take place in Dallas itself with all expenses covered. Of course, I jumped at the chance, I had thoroughly enjoyed working on the Red Baron production for Discovery some months before. Now, I was been offered a once in a lifetime chance to take part in a project of much greater personal interest. I started to make preparations. I also began to look into my own mind to challenge my opinions and pre-conceptions. Like a lot of people in the shooting world, I tended - when in glib conversation - towards a conspiracy view. Gun nuts - and I may well qualify - tend towards the view that the Mannlicher Carcano Carbine is, self evidently, a piece of rubbish incapable of being fired with any speed or accuracy. I have heard it vilified so many times: “why would Oswald pick a junker like the Carcano?” “it’s one of the worst guns ever made” “A professional would choose a ______(add your favourite rifle in the blank space)”. With such comments in mind, I made a pact with myself to be absolutely objective and scientific in the reconstruction. There was responsibility as well as opportunity in my newly appointed task. What we discovered by experiment might well have real historical importance. Our method and reasoning would have to be absolutely impeccable. My own attitude to the project must be completely unbiased (just as I would approach an accident investigation when acting as a specialist consultant). 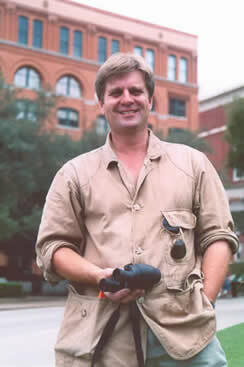 The weapon recovered on the sixth floor of the Texas Book Book Depository was a 6.5mm, Model 91/38, Mannlicher-Carcano Carbine. The overall length was about 40 inches. It had the serial number C2766 and was made in 1940. Oswald bought the gun by mail order for $21.34 including p&p from Klein’s Sporting goods in Chicago in early 1963 using a coupon clipped from the American Rifleman (the fact that Oswald bought it by mail would lead to profound changes to US gun laws and eventually to the Gun Control Act 1968). The scope fitted was a very basic 4x20 of Japanese manufacture imported by Ordnance Optics of Hollywood CA. - the sort of thin tube type that would usually be used on downmarket .22 rifle. Having made this contract with myself, the next thing to be done was to acquire some Carcanos of exactly the right type, not to mention other components such as scope, mounts and sling. I enlisted the aid of my friend Frank Robinson, a US firearms dealer (FFL), gunsmith and engineer. Frank would order the bits and put them together in exactly the configuration that Oswald used. Frank was the ideal accomplice in this mission. Well known in Western Pennsylvania for his deer rifles, he is a practical, old fashioned, gunsmith. Moreover, he was familiar with the Carcano (not that he had much good to say about it) and was working in the trade when the original incident occurred in November 1963. We bought two guns initially (two more would follow later). For reference purposes we also ordered a Tikka sniper rifle in 6.5 Swedish (a very similar cartridge to 6.5 Carcano - see below). The Carcano carbines cost us 60 bucks a piece (£40) which did not break the bank. We were even more surprised to discover that the original scopes were still available from Ordnance Optics of Hollywood, CA. These were outrageously priced at $90 (£60), but still a relative bargain. We also acquired some pressed steel mounts from the same firm. It was quite exciting when all the kit began arriving. The first thing to be noted was that the Carcano was quite crude - as military rifles tend to be - but compact. It looked ugly but handled - once we had washed all the grease off it - better than expected. The bolt was a bit stiff and the trigger pull not up to much, but the bolt travel was relatively short. I tried to cycle the action. Dry firing on a closed bolt and two subsequent shots (manipulating the bolt twice) took approx. 4 seconds. This was without aiming. Oswald appears to have taken something around 8 seconds for 3 shots (missing with the first but hitting with the two subsequent shots). I was very keen to get on with the live firing tests. The iron sights were dreadful. The front sight was loose and off-centre the rear a crude V. The gun was 6 feet or more off target at 100 yards. Frank and I thought it a waste of time considering the open sights from this point on - it was evident to both of us that Oswald could not have used them unless his hits were pure chance - anyone who suggests otherwise has no practical experience of the Carcano. Frank got on with the job of mounting the scopes. One rifle had a better bore than the other. I suggested he tackle that first as time was running out (I was due to get back to England before returning to the other side of the States a month later for location filming Dallas). Discovery, meantime, arranged for a camera crew to come and film some our work. It was a strange moment when I was handed the first completed rifle. It was identical to the recovered weapon in every detail. We had selected the better specimen of two, but Frank had done nothing to the mechanics of the gun: the action and crude trigger mechanism were left untouched and the muzzle was not-re-crowned nor was the gun re-bedded. Frank had only stripped and de-greased the gun and fitted the scope. The 6.5 Italian (or now 'Carcano') was first introduced into the Italian Army in 1891. The trend in that epoc was for smaller-calibre, high velocity, bullets in military rifles. The Italian round looks much like the much lauded 6.5mm Swedish - a cartridge known for its penetration and killing power. Indeed, in the case of the Norma offering, they share the same bullet, the only real difference is 3mm of cartridge case (the Carcano is 6.5x52, the Swedish, 6.5x55). The 6.5 is a most singular, bullet - very long (1.2" in 160 grain form), rather like a pencil stub. Before Alfred, ‘the Brain Surgeon’, Bell went over to the 7x57 for all his hunting, he used the 6.5 (in his case the 6.5x54 Mannlicher Schoenauer) - for shooting elephants! Whatever may be wrong with the Carcano rifle, there is little wrong with its ammunition. Indeed, during the era in question for our project (the early 1960's), I would say that the 6.5 was an almost ideal short to mid-range sniper round. I might add, for what it’s worth, that until I took this project on, I had no idea that it was so similar to 6.5mm Swedish cartridge. If I had known this, I might have been less prejudiced in my comments. The side mounts were an advantage with the stiff bolt (and a neccessisty for the clip loading and for historical accuracy). Everything handled reasonably well and the scope, though, basic and equipped with a moving reticule was up to the job if it did not break and if it could hold a zero. We took the gun back to the improvised range behind Frank’s workshop. This was the first moment of truth. How would it perfom? The special clips (a requirement of the Carcano) were loaded with Norma Ammunition (Oswald had used Western 160grain full metal jackets). Loading was infuraitingly fiddly (later in the project, re-using the cheap, easily distorted, pressed-steel, clips would cause some serious cycling problems). My first shots were at about 30 yards, and, much to my surprise, everything went into about ¾”. This was firing fairly rapidly and without worry too much about the firing position (sitting supported). This was certainly encouraging. I walked the target out to 100 yards. At this range - beyond the 90yards of Oswald's last shot - the gun generally managed about 2” (my best group was 1 ¼”). There were occasional flyers (the third shot from a cold start would typically go high). But, I could see that this gun had the accuracy capability to do the job if the shooter was a competent marksman. One very important question had been answered, but the result would have to be confirmed with a moving target and the stress of a time limit.